Approximately 5 hours tour (Weekend event). 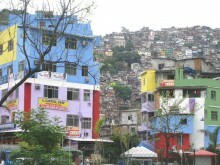 Excursion in Rio de Janeiro. "Feira dos Paraíba's" a big fair in the north of the city with traditional music, characters and the best of the food, music and handcraft from Northeast of Brazil. Brazil is Known for great food and is a true "foodie" destination! Here are some traditional favorites from the northeast, home to the descendants os African slaves. The Gastronomic Tour is a chance to try new things for adventurous travelers: don't be afraid to try some traditional dishes! I am profesional mainly dedicated to organize local private and customized tours during your stay in Rio, with dynamism and safety. I invite you for an unforgetable experience in the "Marvelous City" ! The best way to discover Rio de Janeiro is by foot. This is suitable for the adventurous travelers and most of the tours are made by public transportation: bus, subway and cab (if necessary), private transportation is upon request.